MARSELI - MARKETING AND SELLING IMPROVEMENT. ADVISORY, INSIGHTS AND TECHNOLOGY FOR IMPROVED SALES AND MARKETING PERFORMANCE. AT MARSELI, WE ARE ALL ABOUT HELPING YOU IMPROVE REVENUE PERFORMANCE. THROUGH A UNIQUE BLEND OF ADVISORY, INSIGHTS AND TECHNOLOGY, WE WORK DIRECTLY WITH YOUR SALES AND MARKETING TEAMS TO DRIVE EFFICIENCY AND RIGOR INTO YOUR THREE MAIN PROCESSES: LEAD MANAGEMENT, SALES AND FORECASTING. COMPANIES LARGE AND SMALL RELY ON MARSELI. “Marseli is the perfect testament to the saying ‘When you know, you know better.’ This tool gives the entire sales team personalized insight into their revenue trends." "Spent some time looking at different tools to solve our forecasting needs. The Marseli tools nailed it for us on all fronts. 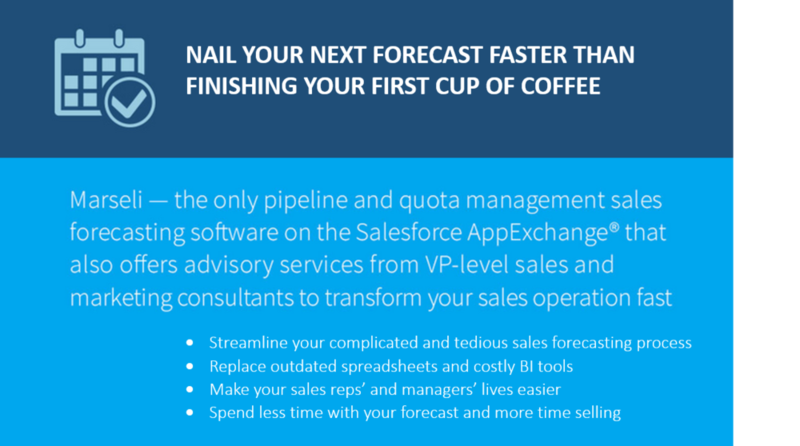 And what really added value was being able to work with the team at Marseli as we adjusted some of our sales process to benefit from Marseli in Salesforce. Added bonus is how it lets you look at your pipeline and forecast from both a sales view and a marketing view. Download it try it -it works." "The added help content and videos is great for getting your sales team all on the same page." SEE HOW MARSELI CAN HELP YOUR SALES AND MARKETING TEAMS.